The Icelandic coat of arms is a shield with a silvery cross in a sky-blue field with a fiery red cross in the middle of the silvery cross. The arms of the crosses shall extend entirely to the edges of the shield in all four directions. The width of the silvery cross shall be 2/9, and that of the red cross 1/9, of the width of the shield. The two upper blue rectangles shall be equilateral, but the lower ones shall be one third longer, and equally wide. The old guardian spirits of the land, mentioned in Heimskringla (Lives of the Kings) by Snorri Sturluson (1179-1241), i.e. a dragon, a large bird, a bull and a giant. The shield rests on a slab of basaltic rock. The blue and the red colours are the same as in the national flag. 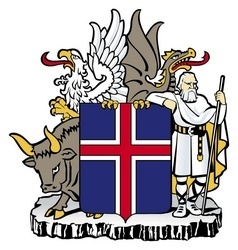 If a consul learns that the Icelandic coat of arms is misused, i.e.. used by unauthorized parties or used as part of a trade mark, signboard, etc., he shall notify an Icelandic embassy or the Ministry for Foreign Affairs in Reykjavik. The coat of arms of the President of Iceland is a shield of the same shape and colours as that of the national coat of arms with a square in the middle where the national coat of arms is shown.